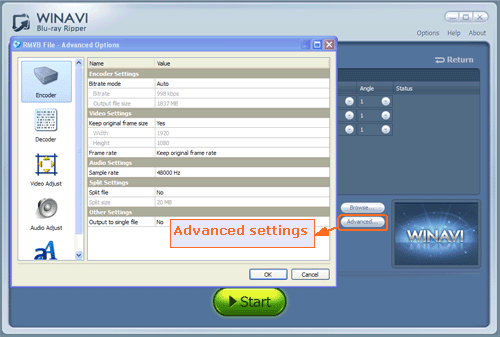 If you want to rip Bluray to RMVB/RM video format, you can use WinAVI Blu-ray Ripper to rip Bluray disc to RMVB/RM format. This software is easy to use and we will guide you the detailed steps about Bluray to RMVB/RM conversion in the following introduction. Step 2: Insert the Blu-ray disc. 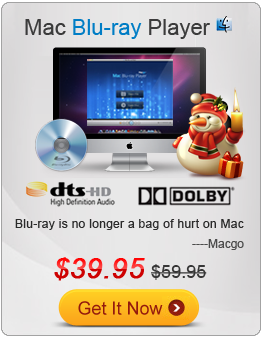 Step 3: Click "Convert from Blu-ray Drive" to import Bluray file from Bluray disc. Then a small window will pop up and ask you to select the output format, here we choose RMVB/RM format. 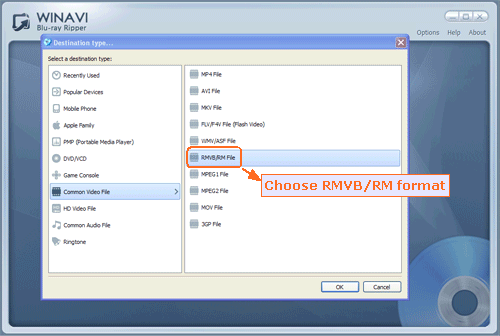 Step 4: Click "Advanced " to customize your RMVB/RM video of output. Step 5: When all the advanced settings have been completed, just click the green button "Start" to rip Bluray to RMVB/RM format. Note that if you want to convert to RM format, please choose RM mode before converting. 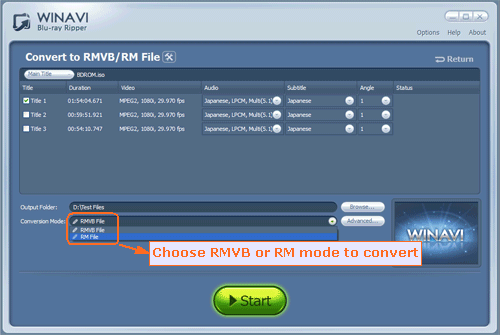 Step 6: Then clicking "Open the output folder" button to check your converted RMVB/RM file when you have finished the conversion from Bluray to RMVB/RM. And now If you also think it is easy to rip Bluray to RMVB/RM, just have a try.